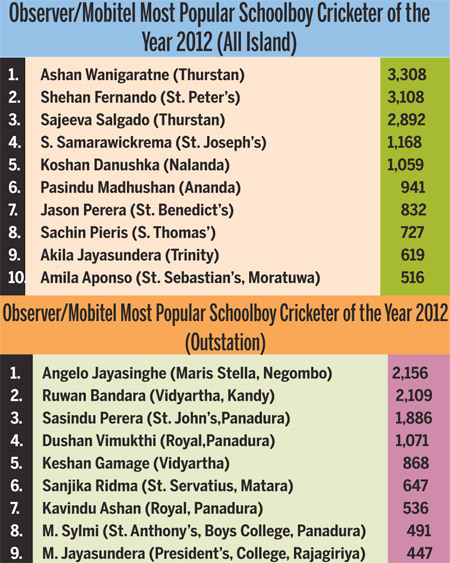 MOST POPULAR SCHOOLBOY CRICKETER: Ashan Wanigaratne of Thurstan College, Colombo and Angelo Jayasinghe of Maris Stella College, Negombo topped the list of the Sunday Observer/Mobitel Most Popular Schoolboy Cricketer 2012. All Island and Outstation Competition at the end of count number 1. This ever popular contest for schoolboy cricketers will be completing it’s 34th year this year and during this period has produced many cricketers who have played at the highest level and gone to represent the country. Keshan Gamage of Vidyartha College, Kandy who became the Most Popular Schoolboy Cricketer 2011 (Outstation) and Dushan Vimukthi of Royal, Panadura are also competing in this year’s competition.